Did you celebrate Valentine’s Day traditionally with chocolates, red roses, and/or a romantic candlelight dinner? Bill and I aren’t much for rituals, but we do enjoy treats and desserts on special occasions. 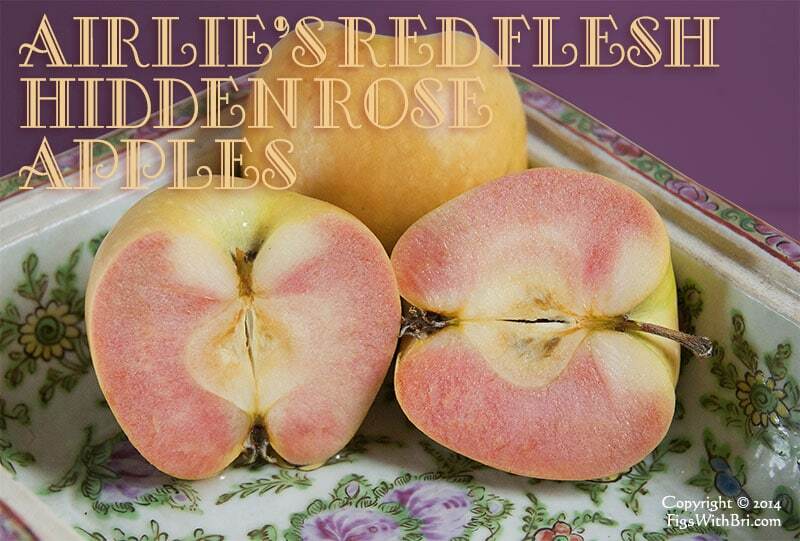 My sister, Victoria, had given us some lovely ‘Hidden Rose’ apples for Christmas. I had saved the last 5 for a baking project. Victoria sent us an apple crumble recipe to try, but I decided to improvise on the Cranberry Apple tart we enjoyed for our Christmas family dinner. Put 1 cup+2-3 Tablespoons wine or grape juice in a small saucepan. Stir in sugar. Heat until the sugar dissolves, then continue cooking at a slow boil for 10 minutes to thicken. Let cool before serving. 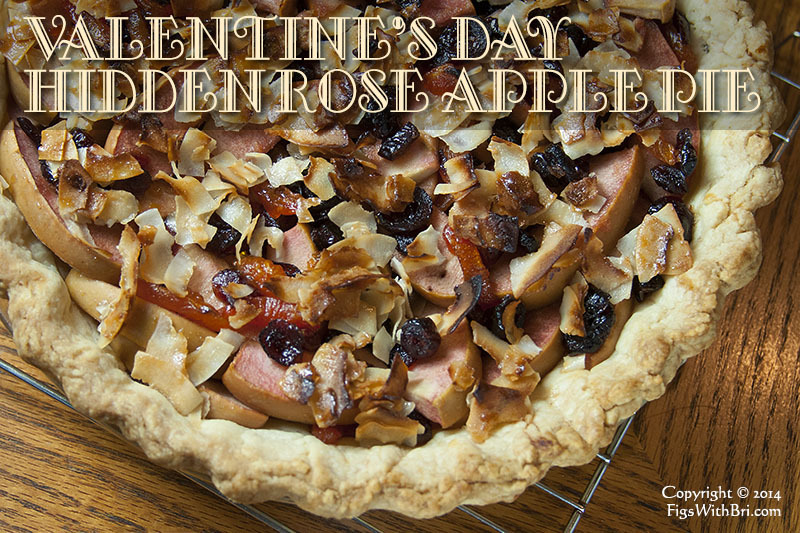 ‘Hidden Rose’ Apple Pie for a lovely Valentine’s Day treat. Adjust an baking rack in the center of the oven. Preheat the oven to 375 degrees. Thaw a good frozen pie dough or make one from scratch, using a tried-and-true recipe. (Our favorite quickie crust made with decent ingredients is sold by Trader Joe’s). 4 ‘Hidden Rose’ apples, washed and cored (leave skins on). Remove the dough from the refrigerator to soften for a few minutes. Roll out on a piece of parchment or waxed paper to about a 12-inch diameter. Transfer the dough to a pie pan. Fold the excess dough over on itself and crimp the edges attractively. 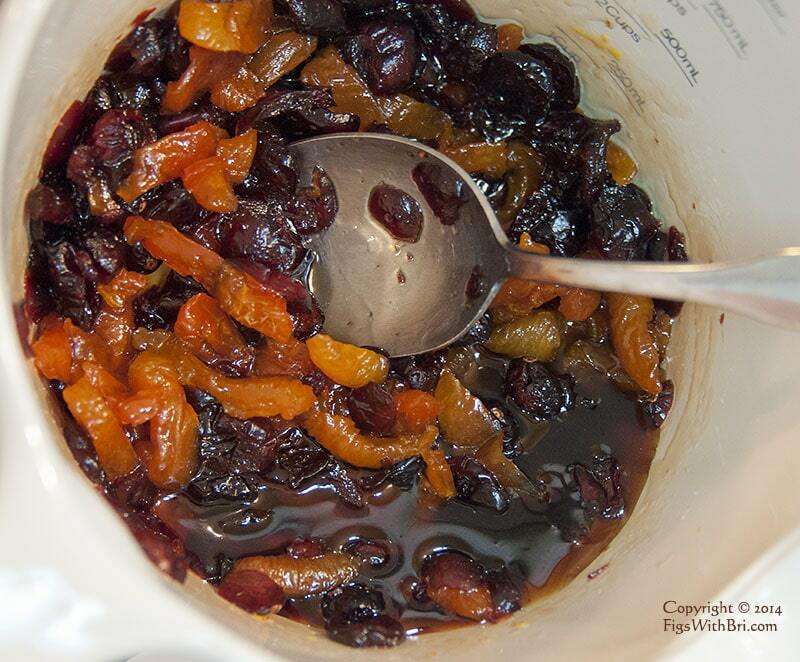 In a small saucepan, combine dried cranberries & Blenheim apricot strips in the wine/wine grape juice sugar syrup. Bring to a simmer over low heat and cook until the cranberries are plump, about 10 minutes. Remove from heat and let cool slightly. While the dried fruit cooks, cut the apples into 1/2-inch thick slices. Put into a large bowl, add the cooked dried fruit and syrup, sprinkle with 1/8 tsp sea salt (or more to taste). Stir gently, but thoroughly, to mix. Taste an apple slice and adjust salt, syrup, lemon juice (if needed) to your preferred sweet-tart balance. 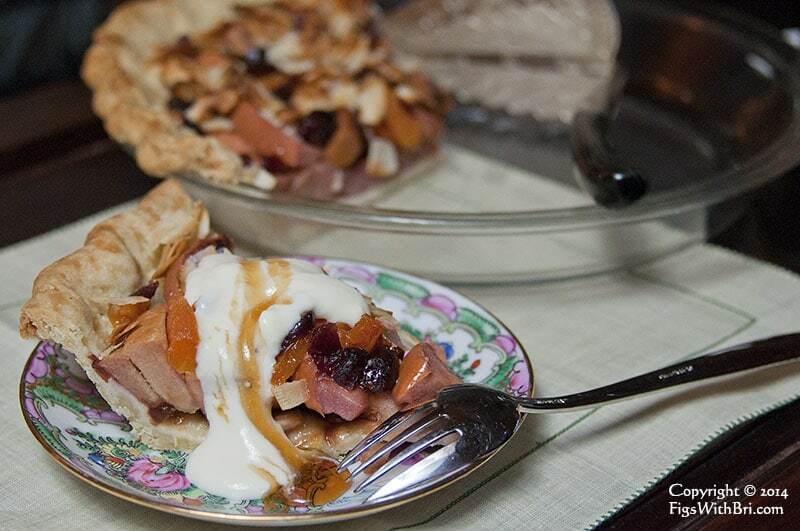 Pile the fruit mixture into fluted pie dough. Brush the pastry edges with whole milk. Add coconut flakes to mixing bowl. Drizzle with a bit more syrup, mix ’til moist and sprinkle over fruit filling. ‘Hidden Rose’ Apple Pie with dried cranberries & apricots, ready to bake. 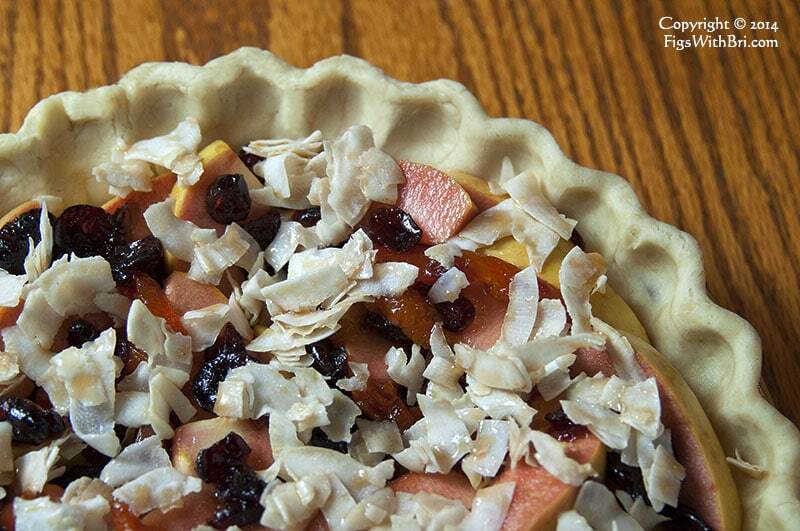 Bake for 25 to 30 minutes, or until the apples are tender and the crust is golden brown. Watch carefully as the syrup covered coconut flakes can burn easily. 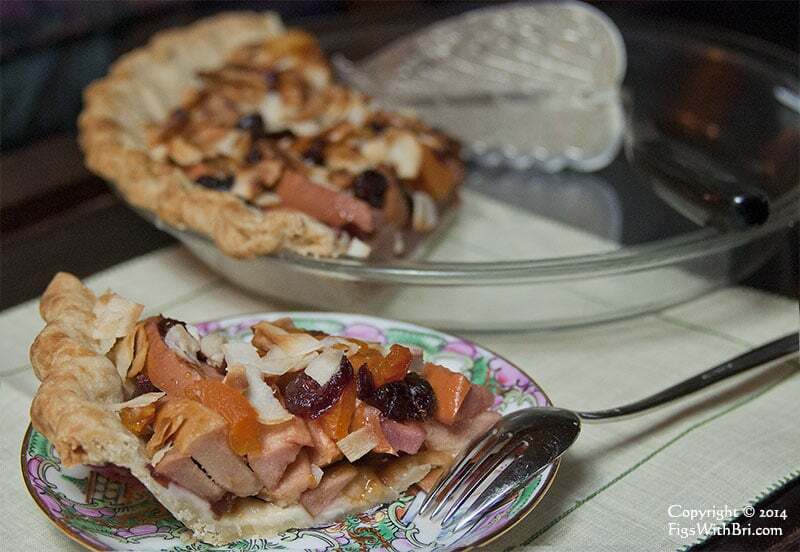 ‘Hidden Rose’ Apple Pie for an extraordinary fruit dessert. 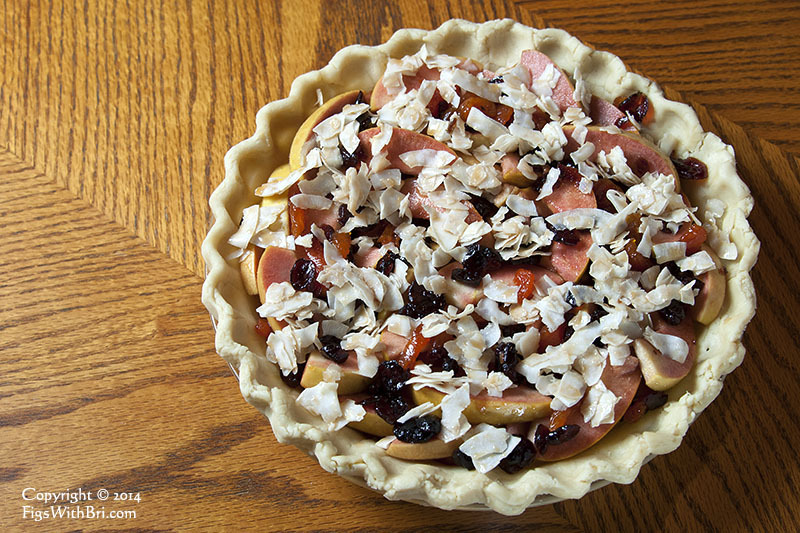 Yummy toppings for ‘Hidden Rose’ Apple Pie include whipped cream or coconut cream, vanilla ice cream with a drizzle of grape syrup. Remove pie from the oven. Cool on a wire rack. Serve at room temperature with any of the following garnishes: whipped coconut cream, whipped organic heavy cream, ice cream or vanilla yogurt topped with a drizzle of Wine Grape Juice Syrup. ENJOY! A special note: These lovely pink fleshed apples keep their color when baked, which make this dessert especially wonderful. What a really lovely pie! Such enticing colors. Yum-O! Victoria ~ Thanks again for these gorgeous apples. They bake up wonderfully without becoming mush. Was delighted they keep their beautiful color. BTW, this recipe is super easy to make, when you have the time. Previous post: ‘Food Is Love’ 2014 Recipe Calendars: Great Holiday, Housewarming & Wedding Gifts!